Hello from Watertown Free Public Library! Hello! A while back Cen posted that my library was starting a digital story time program. When she asked if I’d guest blog about it, I thought…. sure! Why not? The big question I am asked is: How did you bring digital storytime to Watertown Free Public Library? The idea for our digital storytime is the result of reading over and over again how necessary this type of programming is. It’s everywhere- I read about digital literacy in School Library Journal, the New York Times is reporting on the App Gap, or the Wall Street Journal is reporting about toddlers zoning out with iPads. We have an AWE Early Literacy Station in our Children’s Room, and it’s immensely popular. 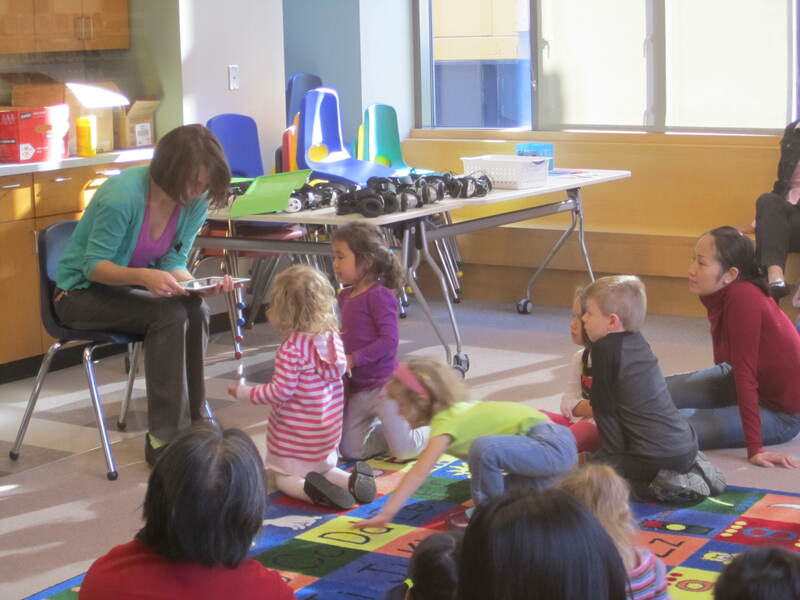 We offer 6 story time options, and all of them are popular and well attended. I put what was staring at me together: why weren’t we offering digital story times? So I wrote up a proposal for my Library Director and Assistant Director. When they OK’d it, I wrote something up for our Board of Trustees. When they OK’d it, I made sure that our Technical Services team was on board, gave them a 4 week timeline with specific instructions about what Apps and ebooks I wanted installed. Our Children’s Department is extremely fortunate as we received a generous bequest about a year ago. Funds from the bequest paid for the materials for this program. I realize this is the part where most libraries get stuck, but for me it wasn’t an issue. So things were moving along! Materials arrived, iPads were loaded, publicity started. But people weren’t signing up. That seems to always be the sticky wicket for us! We try to only require registration when absolutely necessary. There are only 15 iPads, we can realistically accommodate 15 families. To maximize our iPads, I purchased audio splitters and 30 sets of headphones. I had visions of 50 people showing up for this program and feeling overwhelmed and not wanting to turn people down, so we decided to require registration for the program. Instead, there was a slow trickle of sign ups, and eventually the day of the program came and we were only half full. I worried over sign-up for nothing. Even at half capacity, I had my hands full. Parents wanted to know the best way to interact with the Apps: there were some proficient users, but others hadn’t touched an iPad before. And registration for our next session is filling up, and I have TONS of new ideas for how to move the program forward. After we’ve met a few times, I’ll share my tips for what’s been working! Posted on October 25, 2012, in Apps, Early Literacy, eBook, Story Time. Bookmark the permalink. 4 Comments. Watertown’s Children’s Librarian has lots of “big” and “little” fans. Keep up the great work! Hi Christine! Thanks for supporting your library! Did you attend the iPad program? If so, what did you think? What was the best part?